This insightful itinerary is designed to be travelled either as individual journeys or as a combined odyssey to both nations. Whatever your focus, this trip will leave you with wonderful lasting memories of these two amazingly different countries. Beginning in China you’ll travel through three of the country’s most prominent cities – Beijing, Xi’an and Shanghai with many of the must-sees included, from the Great Wall of China to Xi’an’s famous Terracotta Warriors. History, culture, cuisine – it’s all here, including an incredible cruise along the beautiful Yangtze River. Travel to Japan and its vibrant capital of Tokyo. See Mt Fuji and her surrounding lakes and experience the thrill of travelling on a Shinkansen train to Himeji Castle. Experience emotional moments in and around Peace Park in Hiroshima and see the Japan of yesteryear in the preservation districts and World Heritage-listed sites in Kyoto. Your journey ends in the modern metropolis of Osaka. 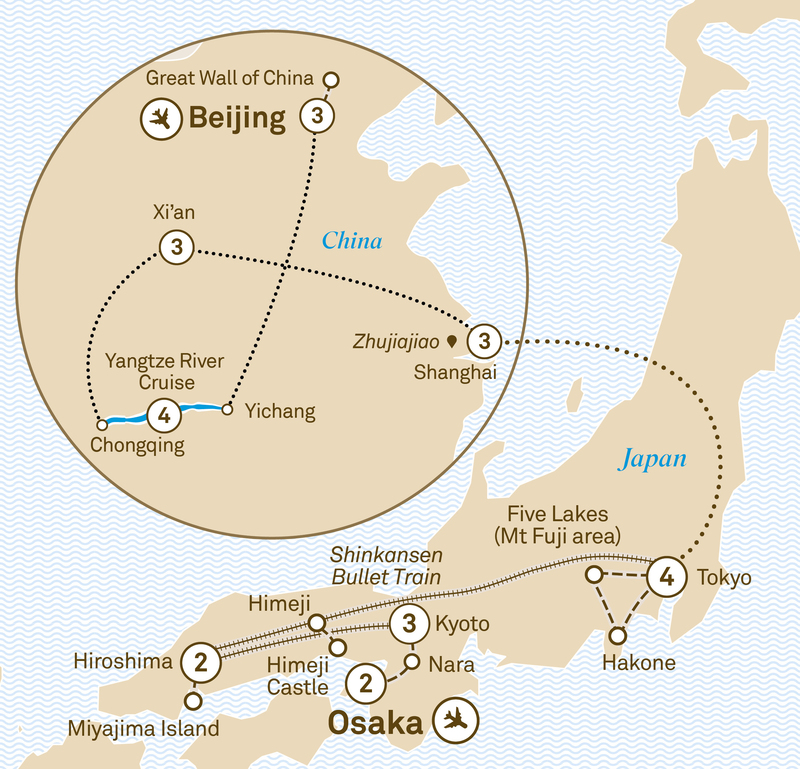 It’s time to bid farewell to China and transfer to Shanghai airport for your flight to Japan. This evening, enjoy your Japanese welcome reception and dinner at your hotel in Tokyo, your Special Stay for four nights.